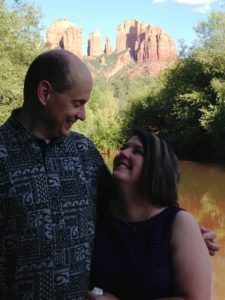 Michael and Jen drove down from Boise, Idaho to celebrate their 25th anniversary and renew their vows. Theirs is one of those wonderful stories where they felt from the start that they were destined to be together — and they still feel that way! They’ve endured a lot of challenges together, notably, Michael’s healing and recovery from a serious illness. But, they feel that these challenges have only strengthened their marriage, and they wanted to celebrate.